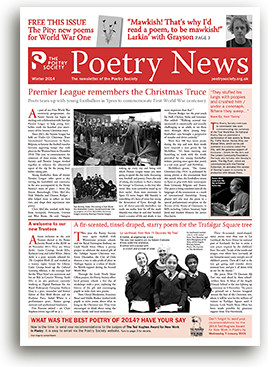 The Spring edition of Poetry News (the newspaper of the UK Poetry Society) features an article by Robin Houghton about blogging based on interviews with seven poets who also write blogs- Sarah Westcott, Abegail Morley, Josephine Corcoran, John Field, Anthony Wilson, George Szirtes and me. John Field writes ‘intelligent, in-depth poetry book reviews’ because he feels poetry is “poorly represented” and that his reviews give exposure that might lead to book sales. I’m sure most people reading this will have, at some point, visited Josephine Corcoran’s marvellous rolling anthology ‘And Other Poems’. Josephine also has a personal blog which gives some insight into her experiences in the poetry world. Abegail Morley (who is kindly featuring two poems from my 2012 pamphlet ‘Gopagilla’ on her ‘Poetry Shed’ at the moment ) says that she uses it as a means of sharing other’s work and that this ‘feeds’ her own writing. My own reasons for writing this blog echo, to some extent, all of those given above. I was inspired to start by Matt Merritt’s Polyolbion, which combined interviews with shorter pieces highlighting poetry books and links to poets work. From early on I also wanted it reflect my experience, to provide a resource for other writers (I’ll blow my own trumpet here- Robin describes it as a ‘rich resource’) and I’m glad that the positive feedback I have received indicates that some of the articles are proving useful in the way I intended. Tune in for more fascinating interviews with UK poet/ editors in the coming weeks!